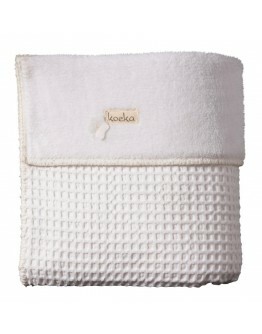 Koeka blanket crib Oslo waffle/teddyThis beautiful soft blanket from Koeka is made from the well-known waffle with the lovely teddy on the inside. Children and even adults like to lie under this soft blanket. Not only nice for the cradle, the park or bed but also as a plaid in the living room, cozy cozy for the TV.This Koeka blanket is also available in a less warm version, lined with flannel, this is called Antwerp. Looking for an original birth gift? With this gift from Koeka you will certain..